People who’ve been there know: It’s nearly impossible to convey the beauty of Italy’s Amalfi Coast in words and pictures — you truly have to see it to believe it. And you can! Avventure Bellissime offers a variety of exciting Italy day trips and Italian vacation packages that include visits to the Amalfi Coast. In the meantime, for those of you not planning a visit this Summer, below is some information. We’re sure it will pique your interest! In beautiful southern Italy, between Positano (an area steeped in wealth and exclusivity) and Salerno (a charming “old town” with reminders of its Medieval history) on the Sorrentine Peninsula, lies one of the most beautiful stretches of coastline in the world — the Amalfi Coast. Boasting 50km of stunning seashore bordered by rocky cliffs and Mediterranean villas, this region is famous for its lemon groves, warm summers, and mild winters. Interestingly, the region’s history has been marked by a fair amount of trouble: The Republic of Amalfi was a “maritime superpower” (lonelyplanet.com) and “economic powerhouse” (wikipedia.com) for centuries until it lost independence in 1073 (wikipedia.com) and then got “sacked by the Republic of Pisa in 1137” (wikipedia.com). “The Middle Ages saw hard times hit the region–the population dwindled as Amalfi’s trade was limited to only parts of Southern Italy, and in an outbreak of plague in 1638 lost nearly a third of its population” (tripadvisor.com). “The Costiera Amalfitana, or Amalfi Coast, is widely considered Italy’s most scenic stretch of coastline, a landscape of towering bluffs, pastel-hued villages terraced into hillsides, precipitous corniche roads, luxuriant gardens, and expansive vistas over turquoise waters and green-swathed mountains. Deemed by UNESCO “an outstanding example of a Mediterranean landscape, with exceptional cultural and natural scenic values,” the coast was awarded a coveted spot on the World Heritage list in 1997” (travel.nationalgeographic.com). While the Amalfi Coast is famous for its unspeakably beautiful geography, it’s also famous for its production of the popular liqueur Limoncello — a more than 100 year old drink made traditionally from the zest of the Sorrento lemon is usually served chilled as an after dinner treat (wikipedia.com). Actor Danny Devito infamously enjoyed a bit too much Limoncello before a 2006 appearance on American TVs The View program! From Positano to Amalfi to Sorrento, a trip to the Amalfi Coast is most certainly a trip of a lifetime. You can visit the Amalfi Coast on a variety of Avventure Bellissime Pompeii and Amalfi Coast small group day tours, private Italy day tours, and as part of the 8- and 10-day private Italy vacation packages. Explore Pompeii and then head out on an exciting drive along the Amalfi Coast, from the comfort of an air-conditioned mini-van with an expert English-speaking guide. 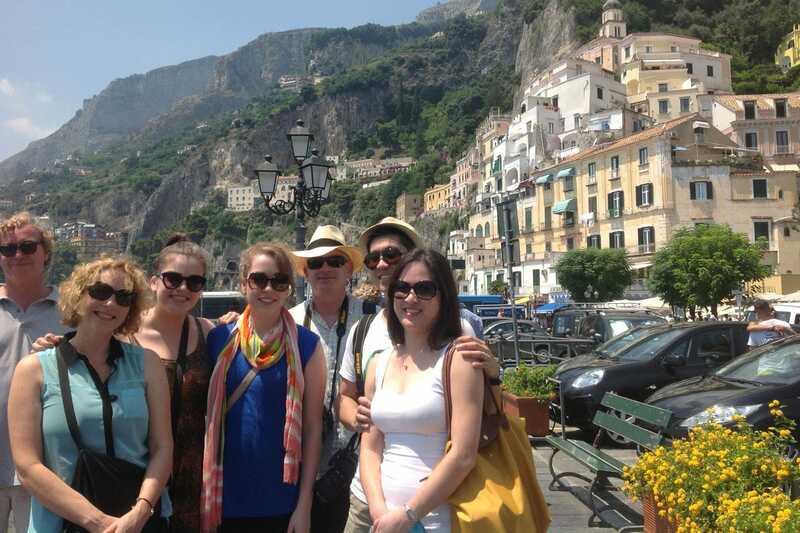 See Positano and Amalfi, with their amazing cliffs, beautiful beaches, and Mediterranean villas. All along the coast, rich Medieval history combines with natural beauty, 19th century charm, and the comforts of a 21st century destination to ensure you’ll make memories of a lifetime here. Join us! Call Avventure Bellissime’s team of Italy travel and tour experts today.